Hispanic adolescents are disproportionately affected by externalizing disorders, substance use and HIV infection. Despite these health inequities, few interventions have been found to be efficacious for this population, and even fewer studies have examined whether the effects of such interventions vary as a function of ecodevelopmental and intrapersonal risk subgroups. The aim of this study was to determine whether and to what extent the effects of Familias Unidas, an evidence-based preventive intervention, vary by ecodevelopmental and intrapersonal risk subgroups. Data from 213 Hispanic adolescents (mean age = 13.8, SD = 0.76) who were enrolled in a randomized clinical trial evaluating the relative efficacy of Familias Unidas on externalizing disorders, substance use, and unprotected sexual behavior were analyzed. 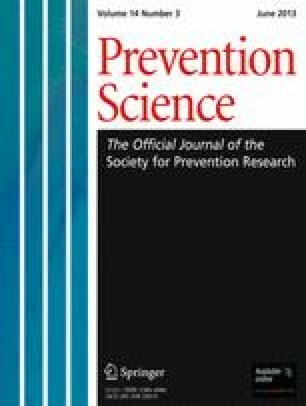 The results showed that Familias Unidas was efficacious over time, in terms of both externalizing disorders and substance use, for Hispanic youth with high family ecodevelopmental risk (e.g., poor parent-adolescent communication), but not with youth with moderate ecodevelopmental or low ecodevelopmental risk. The results suggest that classifying adolescents based on their family ecodevelopmental risk may be an especially effective strategy for examining moderators of family-based preventive interventions such as Familias Unidas. Moreover, these results suggest that Familias Unidas should potentially be targeted toward youth with high family ecodevelopmental risk. The utility of the methods presented in this article to other prevention scientists, including genetic, neurobiological and environmental scientists, is discussed. This article was supported by NIH grant # R01 DA017462 to Hilda Pantin as well as NIH grants # 1R01DA025192, 1R01DA025894, R01DA025192, R01DA025192-01A1S1, and CDC grant # U01PS0000671 awarded to Guillermo Prado. We would like to thank our research team (including our facilitators, assessors, and data analyst), Miami-Dade County Public Schools, and the families that have contributed to this program of research over the years.